Pumpkin oat bars are a healthy breakfast packed with flavor. 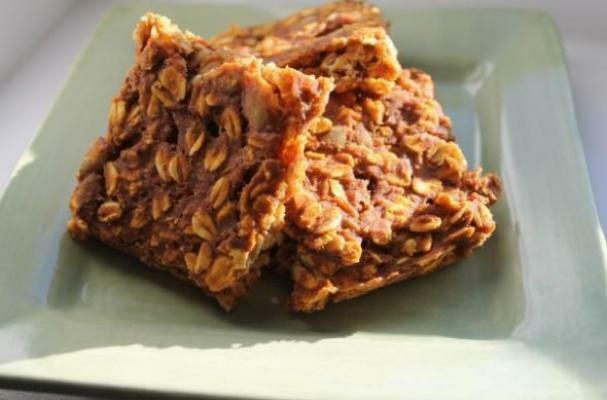 In addition to being nutritious, these bars are super easy to make. With the help with a food processor or blender, they can be prepared in just minutes prior to baking. If you are feeling indulgent, feel free to throw in a 1/4 of chocolate chips. In a food processor or blender, combine the pumpkin, applesauce, banana and nut butter until smooth. Add protein powder, cinnamon, pumpkin pie or apple pie spice, vanilla, and brown sugar. Place the oats in a large bowl and add the creamed mixture. Stir, folding in the pumpkin seeds (optional). Bake at 350° for 30-40 minutes. Mine took roughly 32 minutes to be baked.